Our favorite Sunday of every month is the one when we have some Music by the Fireplace. 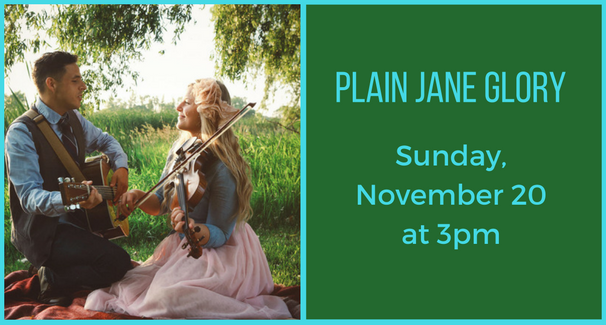 On Sunday, November 20 at 3pm, Michael Boxer and Laura Crosswait, the husband and wife duo that make up Plain Jane Glory. Sweet melodies and infectious energy are the trademarks of their Neo-Folk/Americana music, & they have recently released a second album Grace of Hours. Described as honest, passionate, heartfelt and eclectic, this free concert is not to be missed.